Home » social-media » How To Get The Most Out Of Facebook Privacy Settings? 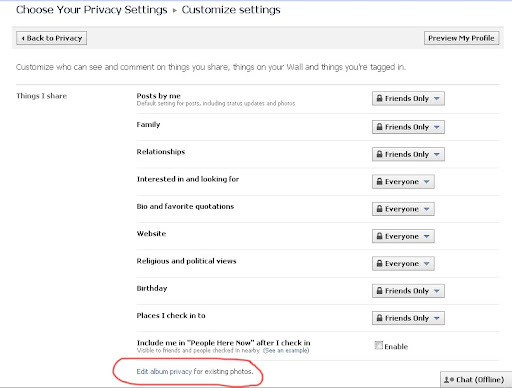 How To Get The Most Out Of Facebook Privacy Settings? Unlike Orkut, Facebook provides a lot of Privacy settings at various levels. At the time of writing this article (i.e. September 2010), it gives the members almost complete control over the visibility of their profile to different sections of people on the internet. And, if utilized effectively, this control can really help to leverage a person’s online profile, because Facebook today is no longer restricted to interacting with friends, family and known associates. It has entered into social networking too, even though it was not the original intent of the developers. 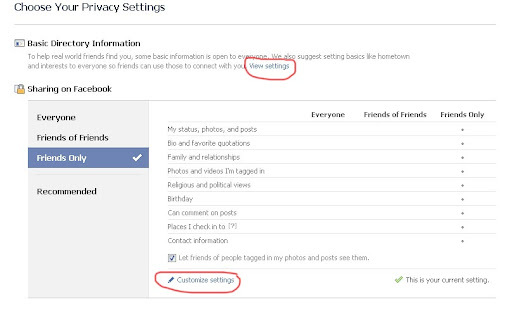 The link “View Settings” lets you modify the default Basic settings for your Facebook profile, and the link “Customize Settings” lets you make changes to Custom Settings. 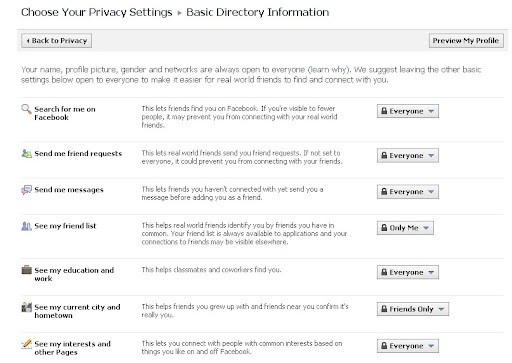 Trust me – you definitely do NOT want to keep the default Privacy Settings of Facebook! Let’s have a look at the Basic Settings first. Ideally, the first 3 options (“Search for me”, “Send me friend requests” and “Send me messages”) should be set to “Everyone”. “Friend requests” can be restricted, but again, you might miss out on the opportunity of a valuable contact because you made yourself so inaccessible. And the option to “send messages” should be available to everyone, because there may be occasions when someone just wants a quick exchange with you, not necessarily leading to a “friendship”. The 4th option (“See my friend list”) should most certainly NOT be set to “Everyone”. If you do that, you are leaving a way for hackers to impersonate you more easily. “Education and work” set to “Everyone” will obviously help old classmates and colleagues to locate you. The other 2 settings on this page are as per your choice. Coming to Custom Settings on Facebook now, we have a longer screen. So I have taken 2 screen-shots of it. Obviously, most of the settings in this screen should be “Friends Only”. However, as you can see, I have left some as “Everyone”. The idea is: Go through your profile from a third-person’s perspective. If you see anything that might actually be a point in favor of you, for the kind of networking you have in mind, then make it public. Otherwise leave it to “Friends Only”. Once again, everything here SHOULD be “Friends Only”. One important point: Make sure that you leave the “Friends can post on my wall” setting checked. It is really annoying when someone in your friend list wants to leave a quick “Hello” or a “Happy birthday” on your wall, and finds that it is disabled! 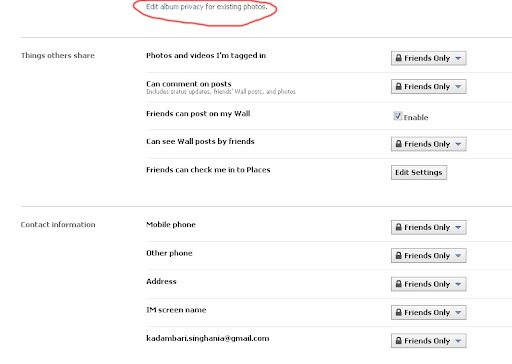 And there is an “Edit album privacy” option circled in red in both the pictures above. Clicking on that link will let you set privacy settings for each of your photo album on Facebook. There is a further in-depth setting level provided by Facebook (other than Friends, Friends of friends, Everyone, Only ME), with which you can create custom lists (School, Office, Family, Games etc), and you can set parts of your Facebook Profile visible to only specific lists. But we’ll cover that in detail next time. In the meantime, please share this article with all your Facebook friends, because, as I have seen over the last few months, most people still use the Default settings of Facebook, which is dangerously public. You can use the blue Facebook “Share” button on the left. The other sharing options are also given below. U r welcome Deeps. Plz do circulate this post in your circle too... I see sooooooooo many FB profiles daily who have practically everything "public" -- i.e. the default settings of FB. Wordless Wednesday: How To NOT Lose Weight! A Proposal No Girl Could Refuse!